​Yes! Firstly make sure you have an account with us and that you are signed in. 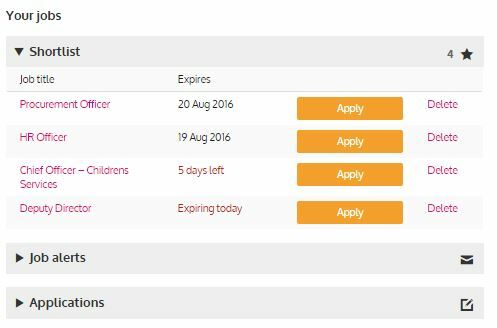 When you have found the job you wish to apply for, click on the orange ‘apply’ button. A new window will open to start the online application.Addinformation into the online application form and then click on ‘save progress’. You can retrieve your saved application by navigating to the Candidate Home Page. Alternatively, you can find the job you are interested in and click on the star ‘Save’ icon. Once this has been done the star will change and it will say ‘Saved’ next to it. Or you can view your saved jobs, by clicking into your account and selecting ‘Your jobs’. Any jobs you have saved will sit under the shortlist section on this page and you will be able to see the job title and the expiry date. NOTE: Every time you start an application and it is saved or submitted you will need to navigate to the Candidate Home Page to see its status. The shortlist of jobs will remain regardless of these actions and would need to be manually deleted.